Students in Cookbooks and History (MET ML 630), directed by Dr. Karen Metheny, researched and recreated a historical recipe to bring in to class. They were instructed to note the challenges they faced, as well as define why they selected their recipe and why it appealed to them. Here is the first essay in this series, written by Caroline Pierce. When recreating a historical recipe, it’s best to choose one that does not require you to fire up the hearth or stand stirring beans for twelve hours. It’s also best not to choose a recipe that requires a calf’s head or freshly slaughtered goose – those things are just tough to come by! Instead, find a recipe that allows for the greatest amount of interpretation so that you can set it in the oven, walk away, finish the rest of the homework you have looming, and come back when it has cooked to perfection. 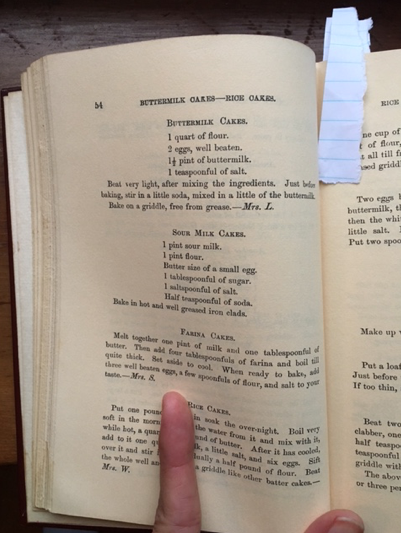 Specifically, I would recommend making the sour milk cake found in Housekeeping in Old Virginia, edited by Marion Cabell Tyree. Bake in hot and well greased iron clads. Despite the fact that this recipe does not call for any animal parts or for me to mill my own grains, questions do arise about the ingredients. Such as, is buttermilk an acceptable alternative to sour milk? What types of flour were used in 1879? How small is a small egg? And what’s a saltspoon? One can imagine that this recipe was employed in order to use up milk that was a bit past its prime, as refrigeration wasn’t a reliable option for many cooks at the time. I didn’t have any milk in the fridge that was going bad, so buttermilk would have to do. King Arthur Flour was founded in 1790, but somehow I doubted that a housewife in Virginia was ordering specialty flours from Vermont. 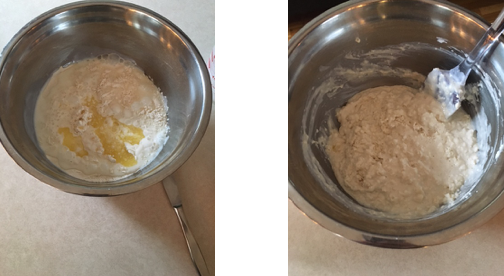 It’s likely that the flour of 1879 was much less processed than the flour we use today, but unfortunately I was fresh out of whole-wheat flour, so I made do with all-purpose flour instead. The only eggs that I had on hand were labeled “Large.” In fact, I don’t think I have ever seen small-sized eggs labeled at the grocery store. (Where do the small eggs that hens lay go? A question for another day.) 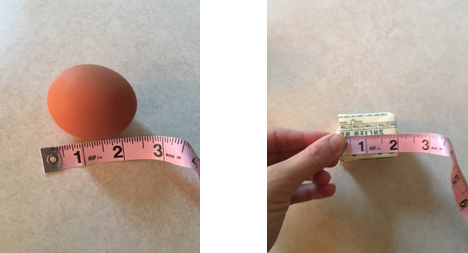 In order to gauge how small a small egg is, I decided to measure my large-sized egg, subtract a quarter inch, and then use that measurement to decide how much butter to use. Easy. I performed a similar technique for determining the size of the saltspoon. Historic saltspoons measure about a half to three quarters of an inch across. Luckily, a half-teaspoon seemed to fit these dimensions, so I just rolled with it. I gathered the materials I thought I would need and got cracking. The recipe didn’t say how to mix things together, but I knew that most baked goods combine the dry materials in one bowl and the wet in another. I started off by mixing the flour, salt, sugar, and baking soda together. The instructions didn’t say what to do with the butter, but I felt melted butter would be easier to work with than hard, or evenly slightly softened butter, so I popped it in the microwave and enjoyed the convenience that electromagnetic radiation has to offer. The instructions clearly state to bake hot. I had preheated my oven to 375°F because I figured that was a pretty hot temperature to bake a cake at. However, once I got measuring and mixing I realized that this was no ordinary cake. There weren’t any eggs, and the batter started to resemble biscuit or pancake batter. I knew that drop biscuits loved high heat and that is what makes them rise quickly and develop a nice crust on the outside. I figured my sour milk cakes would like this treatment also, so I jacked up the temperature to 425°F. While I waited for the oven to heat I greased up ye old iron clad, which I interpreted to be a cast iron pan. The author calls for iron clads, plural, but I only had one large cast iron to work with. Although I did have a block of lard on hand (don’t ask) it was frozen solid, so I used butter to grease the pan. Once the oven was hot, the cast iron went in the oven and the guessing games began. Is the oven hot enough? Should I have preheated the cast iron? How long could this cake bake? And how much homework could I get done while it was in there? While you’re contemplating all that, the ten-minute timer on your phone will go off before you have a chance to remember what chapters were assigned for that week. After ten minutes the top of the cake was still pretty pale and the sides were only starting to brown. I put the cake back in for 5 more minutes, waited, realized that still wasn’t enough time and baked for 5 minutes more. At 20 minutes the cake had golden brown sides, a firm texture on top, and a fragrant aroma. The sour milk cake was baked. I let the cake cool in the pan for a little while, because I knew it needed to set up a bit and would probably just break apart if I tried to extract it immediately. After 5 minutes of impatient waiting I slid the cake out onto the baking rack to cool completely. I sliced the cake into 16 wedges, and packed them up for my inquisitive classmates, who undoubtedly slaved away all weekend cooking boiled tripe and pickled pigs feet. The resulting cake was light and airy with a taste and texture not unlike a baked pancake, and would have been a pretty tasty option for someone trying to use up a gallon of half bad milk. Recreating historical recipes is challenging not only in the interpretation of measurements and ingredients, but more broadly in the act of recreation itself. Mark Smith writes in “Producing Sense, Consuming Sense, Making Sense” (2007) that trying to replicate historical events by reproducing a past stimulus is fruitless because the way that we sense things has changed even if the input is the same. While we may seek to understand a given culture’s history by cooking their recipes we can never truly replicate that sense because our context for the recipe is entirely different today than it was in the past. 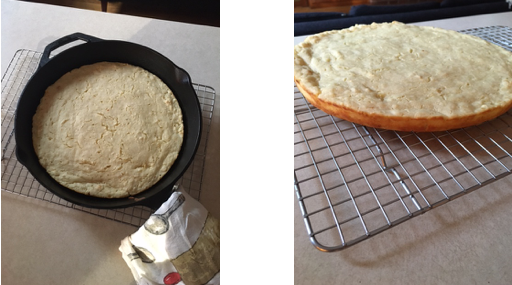 Regardless of whether or not I was able to accurately recreate the sour milk cake, it will always be different than the one made in 1879. I didn’t make the sour milk cake because I have a constant daily supply of milk that must be used or risk having it go bad. I didn’t have to collect wood and light a fire or churn my own butter or worry about bugs in the flour or the price and scarcity of sugar. I went to Whole Foods and bought milk that someone soured for me, I turned the dial on my oven to 425°F, I collected ingredients from my electric refrigerator, and melted butter in a microwave. I made this cake because I was asked to, but I didn’t have to. I didn’t have ten other dishes that I needed to make that day or chores that needed to be completed. As a woman I am not tied to the hearth and home in the way that a housewife in 1879 was. I have the freedom and movement to pursue an education and pick up a bag of hamburgers for my family if I want to. The sour milk cake was delicious, but it still tasted different than it would have in 1879, and I am pretty sure I nailed the recipe. Smith, Mark M. 2007. Producing Sense, Consuming Sense, Making Sense: Perils and Prospects for Sensory History. Journal of Social History 40(4): 841-858. Tyree, Marion Cabell. 1879. Housekeeping in Old Virginia. Louisville: John P Morton and Company.